Static or destination NAT is not working in filter based forwarding or source-based routing scenarios. If we try to ping from our server 192.168.1.69 to Internet (say 192.168.5.1) we are able to ping successfully but ping from Internet (say 192.168.5.1) fails to 192.168.3.69 (public IP of 192.168.1.69). We want the ping from Internet to our server to succeed. <strong>On checking the log file we will find the following:</strong> Apr 23 23:12:30 23:12:29.969642:CID-0:RT: route lookup: dest-ip 192.168.5.1 orig ifp ge-0/0/0.0 output_ifp ge-0/0/1.0 orig-zone 7 out-zone 7 vsd 0 The above log entry means that though the packet came through ge-0/0/0 but reverse route lookup of the source i.e. 192.168.5.1 finds the output interface as ge-0/0/1 (If these interface were in different zones we would have seen a zone mismatch error). Also if we will check the session for the ping packets: xroot@220# run show security flow session protocol icmp Session ID: 10773, Policy name: default-policy-00/2, Timeout: 2, Valid In: 192.168.5.1/0 --&gt; 192.168.3.69/3430;icmp, If: ge-0/0/1.0, Pkts: 1, Bytes: 84 Out: 192.168.1.69/3430 --&gt; 192.168.5.1/0;icmp, If: ge-0/0/2.0, Pkts: 1, Bytes: 84 Total sessions: 1 You can see in the above session interface is ge-0/0/1.0 and not ge-0/0/0 through which packet actually came. 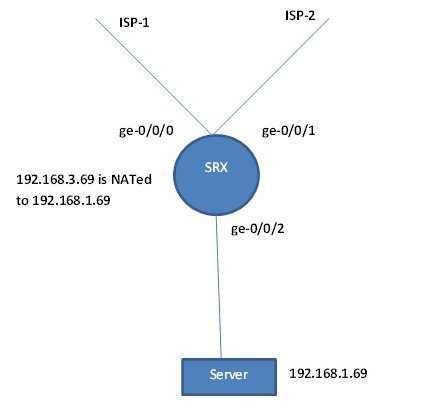 This happens as reverse route lookup will only take place in the routing-instance of the interface at which the packet arrived. In this case that interface is ge-0/0/0 which is in default routing-instance and since in default routing-instance the default route is through ge-0/0/1 reverse route lookup results in that interface. You can see in the above session interface is ge-0/0/1.0 and not ge-0/0/0 through which packet actually came. This happens as reverse route lookup will only take place in the routing-instance of the interface at which the packet arrived. In this case that interface is ge-0/0/0 which is in default routing-instance and since in default routing-instance the default route is through ge-0/0/1 reverse route lookup results in that interface. You can see now both original and output interface are same. Now the interface is ge-0/0/0 instead of ge-0/0/1 as seen earlier.